Now what is Podunk you ask? According to urbandictionary.com, a podunk is a "small unsignificant village or town." All my life I've heard podunk used in "Joe Shmoe went to Podunk University and is now a loser" so I guess it has a negative connotation. 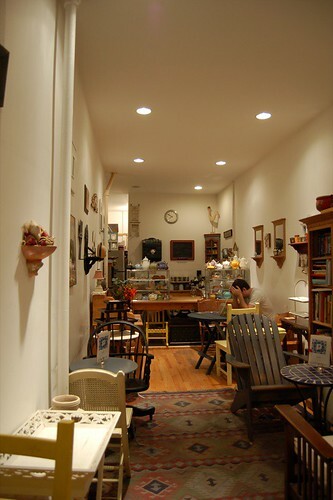 Well, the word no longer holds any negativity in my mind; it is an east village tea cafe that is an escape from the hustle and bustle of the city. It was a rainy and groggy summer day, and it was the first Saturday night I had off in a while. I was so used to eating at my desk I wasn't sure what to eat in the real world. J and I decided to go to Degustation, one of Jack Lamb's establishments (much more to come about that, and him, later). Degustation was all booked, so we ended going to Jewel Bako instead. We decided to take a walk, and after passing a store of witchcraft-ish things, we happened upon Podunk, which was so charming that it had an Are-You-Afraid-of-the-Dark quality to it. 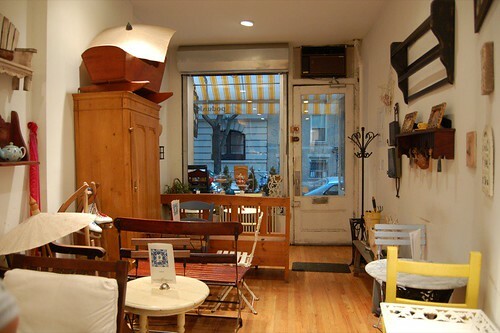 What's even more surprising than the store itself is owner Elspeth Treadwell, who requested not to be in pictures. 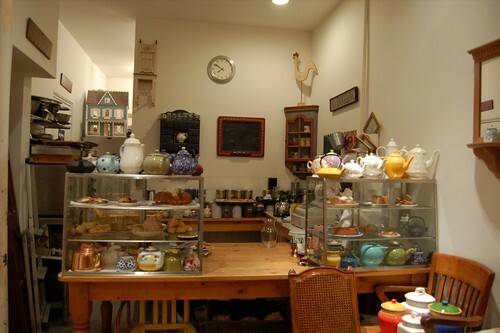 She fit the part of charming tea cafe owner so well that, it seemed like a hoax to me. She was wearing perfectly circular dark rimmed glasses, a mother-goose dress, and had the most stereotypically motherly voice I've ever heard. So at this point, I'm assuming she moved here from amish Pennsylvania and had been baking her entire life. I decide to delve a bit deeper. HH: So what's your story? ET: Harhar, why does everyone ask me that? ET: Well, I used to work in corporate America. HH (in disbelief): You have got to be joking! ET (not joking): Nope, I worked in marketing and a big company, and I was working so much I never got to see my family. I thought that opening Podunk would be a great way to see them all the time. So there you have it. The exit opportunities from the business world are diverse. Last but not least, the food was eggselent. 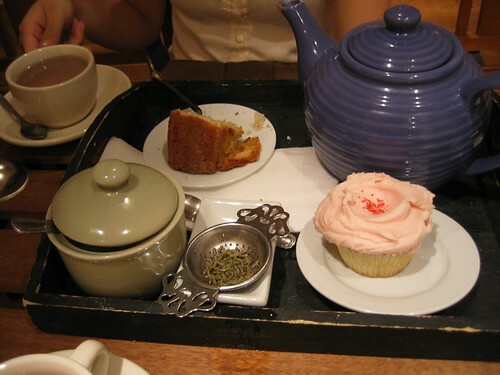 Mother Goose Treadwell's baked goods are to die for. J and I believe that there's a psychedelic quality to them, but let's not go there. Her cupcakes are good, but what you really need to get is the lemon blueberry cake with a crunchy crust. Crunchy on the outside, fluffy on the inside, great lemon and blueberry accents, and not too sweet. Thank you for leaving corporate America, Ms. Treadwell. Ok, way long delayed post. I don't really have an excuse for not blogging, except that it's senior year and, well, that should suffice. 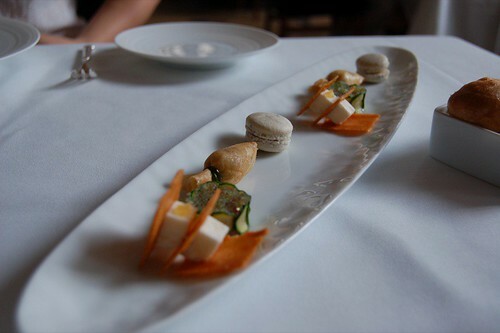 During the summer, I got the chance to try Eleven Madison Park, for which Chef Daniel Humm left Campton Place in San Francisco. Unfortunately, I went to Campton Place about 2 weeks after he left, only to be disappointed and quite disgruntled. Eleven Madison Park is a Danny Meyer restaurant, housed in the Credit Suisse building. I don't know, the contemporary cuisine just didn't really match the art deco and marble credit suisse floors. Yes it was fancy, but I preferred not knowing I was on the grounds of an investment bank yet again. 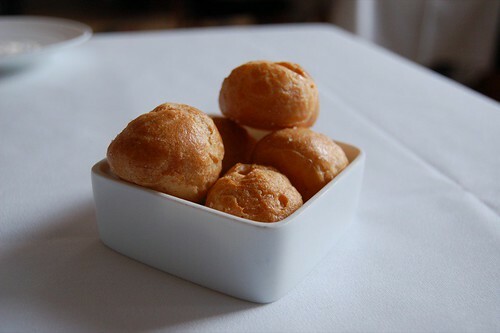 We started off with some cheese puffs that were very reminiscent of French Laundry and Per Se. I can always go for these. (1) Truffled goat cheese croquant - Though I'm not too big a fan of goat cheese, this was quite palatable. The cheese was very unoffensive, and surprisingly did not overpower the buttery crisps. (2) Hamachi tatare with wasabi tobiko inside sliced cucumber - Quite good, and tasted exactly like what you would expect. I enjoyed the pristinely cut cucumber though. (3) Sweetbread cornet - I don't remember detecting sweetbreads in particular, since this tasted like a nondescript fried thing. And those always taste good. 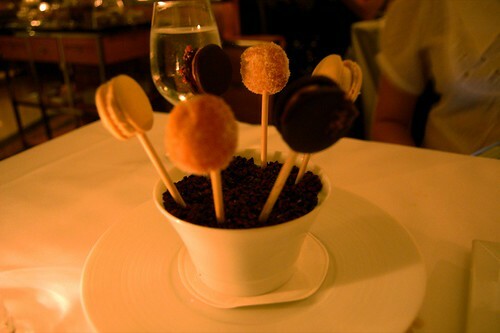 (4) Foie gras macaroon - I was a bit turned off by the macaroon, just because I was in the mood for savories. 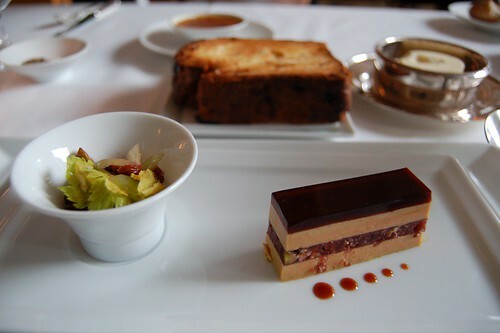 It was quite sweet, and I usually like foie gras paired with a tart/sweet ingredient, but this just didn't do it for me. This was delicious. 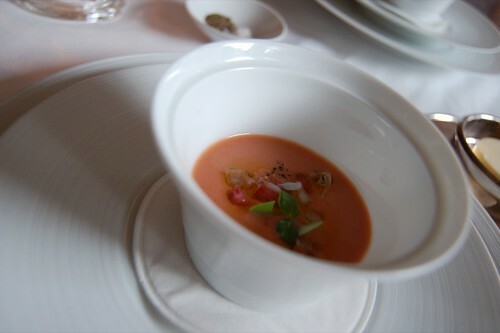 Exactly what we needed on a hot summer day was a chilled semi-sweet and tart gazpacho. It had the perfect texture - super strained yet substantial - and most of all, refreshing. I forgot to take down the name of this, but there were sliced raw scallops and langoustine in a broth. I don't remember much, except that I thought the broth was too bland, but I enjoyed the flowers and watermelon squares. Oh, and that it was pretty. My friend J had warned me that I'd get all foie-d out with the Eleven Madison Park foie gras dish, but I really enjoyed this. I liked the cherry pairing, which worked quite well with the rich and livery fg. The bowl of pistachios, fennel, and cherries was great as well, and accentuated the nuttiness in the foie. The creme brulee was sinfully delectable, with a very nice torched sugar crust. The brioche was delicious, but I seriously need more practice eating a flaky, buttery brioche without making a huge mess on the table. 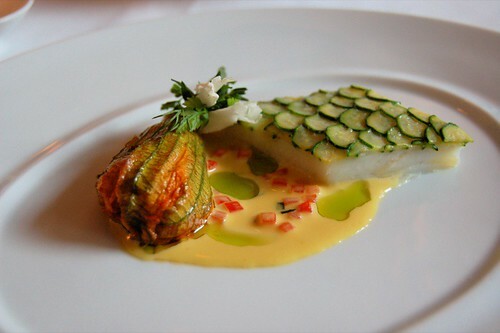 I also want to note that up until this point, I am very impressed with the precision in the plating of dishes. 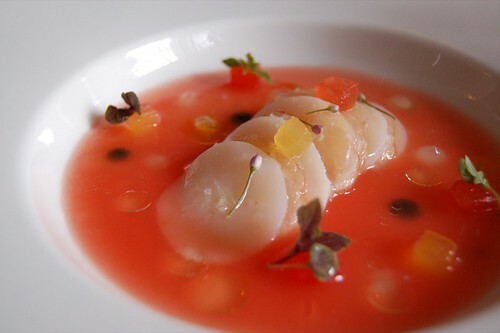 Presentation is obviously very important to EMP, with the descending size of the cherry dots, the pristinely cut foie-cherry layered structure, and the strategically placed flowers on the scallop. Again, I was delinquent in taking notes or remembering things, so I do not remember the exact name for this entree. 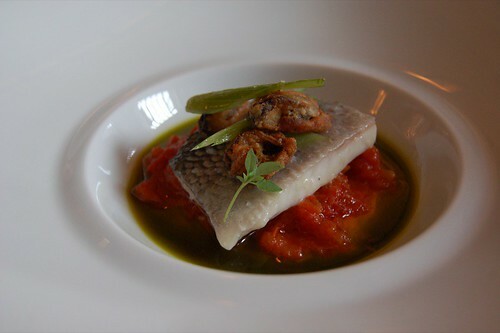 The loup de mer, a sea bass, was smooth and fatty, but rather bland in flavor. In fact, the only flavor came from the tomato puree and grassy olive oil. The accompaniments were fine but felt heavy with the already fatty loup, especially for a summer dish. However, the texture of the fish made up for all that - I suspect that it was cooked sous vide, because I have never had such smooth and silky sea bass. It was July 4th weekend, and I had just finished watching Ratatouille. I was pretty blown away by the movie, not just because it was about food and small furry animals, but because of some really smart humor as well. In fact, I do not know where it got its G rating, because it certainly wasn't. But I digress. 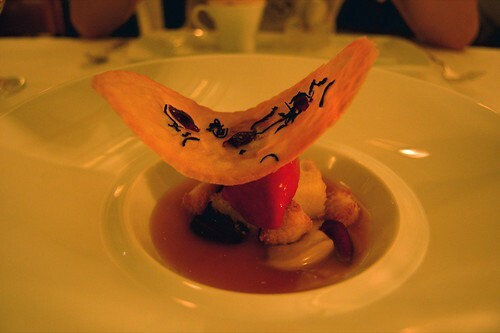 So I was really enamored by the one scene where they bring out the ratatouille, which was designed by Thomas Keller himself. I then decided that my holy grail of the summer would be to find some ratatouille. Two days later, I find myself at Eleven Madison Park, staring at this plate with a bulb of ratatouille. And before I begin, I have to say this was one of the most beautifully presented dishes I've had. Even my mother called me up to ask me about it, when I posted my preview a few weeks ago. 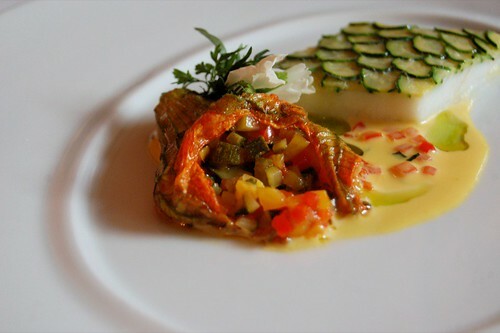 Now, I think it is absolutely genius to stick the ratatouille inside a zucchini blossom. I really don't get how they did it, but this was just so delicate that I felt guilty eating it. Minced pieces of peppers, zucchini, tomatoes, are tossed together and stuffed inside the little zucchini pocket. I asked our server whether the ratatouille was offered on the menu as a result of the namesake movie, but it had been on the menu all along. Genius, I tell you. 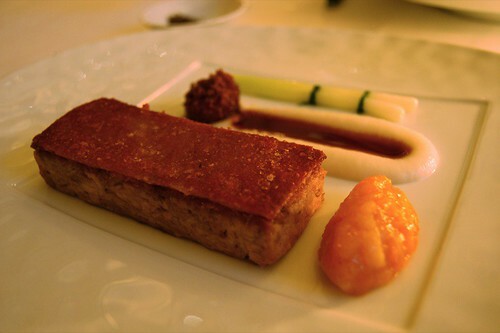 I must admit, I go through stages of not eating pork, so this was the porkiest dish I had in a while at that time. The pork itself was quite good, tender and juicy, compressed under the pristinely cut piece of skin (notice a trend here?). 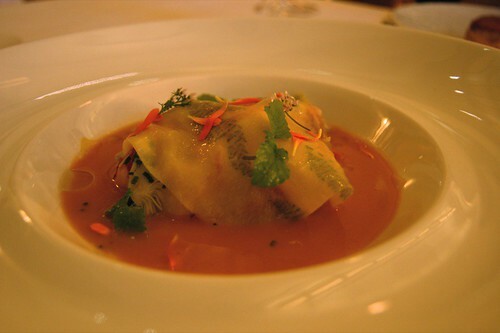 The five spice jus was a great accompaniment, partly because it is such a familiar taste in Asian cuisine. The suckling pig is one of the more known dishes from EMP, but I have to say it wasn't as transcendental as I had expected. Yes it was good, but I've had better in dim sum houses in Hong Kong, and I just expected something different with this pig craze that continues to sweep New York. I don't really know why I try with lobster. I know that I don't like it, mainly because of the texture, but I keep trying to like it. Sort of like my thing with cupcakes. But anyway, this entree again looked better than it tasted. 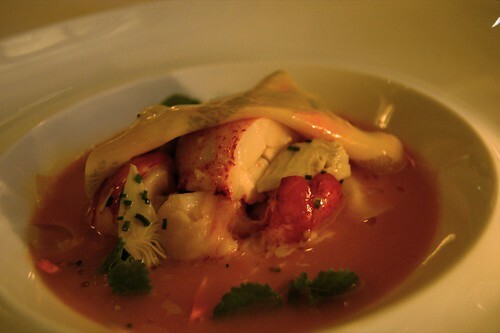 The lobster meat was fine, and the thin, herb infused pasta was delightful, but it really tasted subdued. Along with the fish dishes, I just felt the chef was holding back a little, and not really giving us the refined intensity that allows me to detect individual ingredients. Cherry sorbet with earl grey creme, shortbread and crisp. I really enjoyed this one. 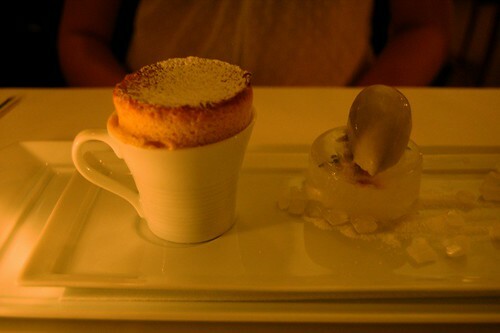 The sorbet was rich and tart, and the shortbread pieces were crispy on the outside, soft and moist on the inside. Great for chocolate lovers; unfortunately I am not one of them. Our meal only comes with two desserts, but we decided to be gluttons and get the peach souffle as well. Unfortunately, the souffle fell below expectations, as it was again, rather subdued and way too moist. It rose quite nicely at the crust, but inside the cup, it tasted raw and soggy. 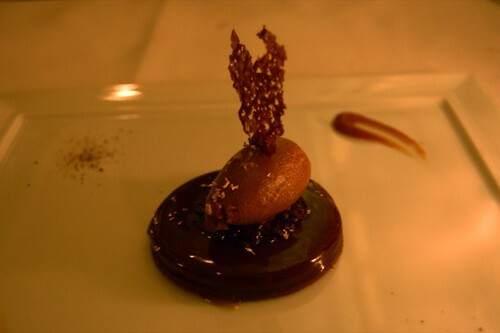 Eleven Madison Park was good, but was not all that I had expected. 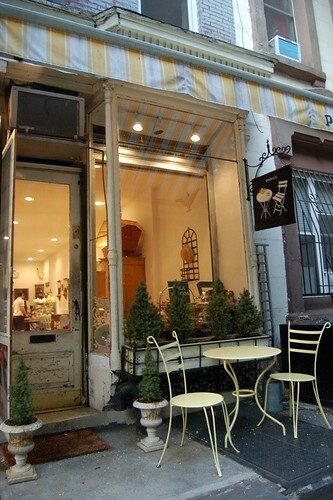 The menu is pretty innovative and market-driven, but I felt that everything was lacking soul. Each plate was so precisely constructed that it was almost painful to ruin the arrangement, but the flavor fell short. It was just a recurring theme that everything looked better than it tasted that night. That said though, it was still a very enjoyable meal, and for cuisine that is contemporary, it actually tasted very good.